Vital records, such as birth certificates, may be obtained through the state health department. There are many circumstances which require a birth certificate as proof of identity or citizenship. Informational birth records may not be acceptable as valid proof of identity as in cases of passport applications or school registration. In these instances, you will need to obtain a long-form copy of the birth certificate, also referred to as a certified birth record. Birth records are maintained by the state health department and can be requested from the state's Office of Vital Statistics. Applications are available online and requests may be submitted in person, by mail or fax. Go to the Centers for Disease Control website to view an interactive listing of Vital Records offices by state. Click on the state in which the birth occurred to access the website of the appropriate agency, as well as the phone number and address where requests may be sent. Download and print an application for a certified (long-form) copy of the birth certificate. Most applications are available in a PDF format and you may need to install the current version of Adobe Reader to view the document. Provide all requested information including the full name on the birth record, name of father and mother (including maiden name if applicable), date and location of birth, relationship to the subject of the birth record and reason for request. 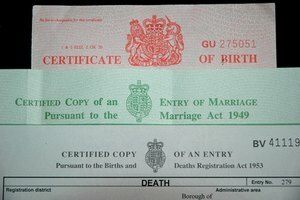 Complete and sign a statement confirming your relationship to the subject of the birth record. The statement must be notarized. In an effort to prevent identity theft, many states only allow access of certified copies of birth records to the subject of the birth record, a parent or legal guardian. Mail the completed application and sworn statement to the Vital Records office. Enclose a copy of your driver's license or other government-issued photo ID, as well as applicable fees in the form of a check or money order payable to the Vital Records office. Provide credit card information for faxed applications. If you choose to submit your application in person, the sworn statement may be signed and witnessed at the Office of Vital Statistics. A non-refundable search fee may be retained by the Vital Records office if the record is not found. Complete the application neatly and accurately to ensure the record is located.